Anastasia Figuera/Staff Photographer The Engineering Building will undergo renovations to update electrical and mechanical systems, perform maintenance and redesign rooms to comply with standards set by the Americans with Disabilities Act. 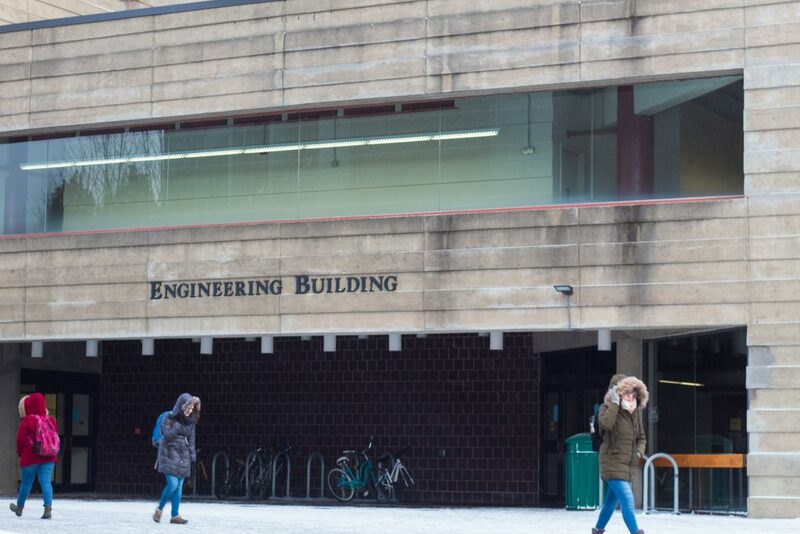 Starting Feb. 4, students and faculty in the Engineering Building may notice construction crews tearing down walls, replacing outdated electrical systems and reconfiguring rooms. Announced via a Dateline statement on Jan. 24, the renovations are set to be finished in summer 2020. Until then, classes in that section of the building will be relocated, according to Heath Weeks, the architect working with Physical Facilities at Binghamton University. Other portions of the building have undergone renovations recently, leaving this portion as the last phase of the renovation project. Weeks said the last renovations were in 2013 and improved Watson Advising and portions of the second floor. However, the areas now undergoing renovations haven’t been updated in 12 years. While none of the updates or replacements are being made because of safety risks, Karen Fennie, communications specialist for Physical Facilities, wrote in an email that they are necessary for properly maintaining the building, which opened in 1976 and was designed by Curtis and Davis Architects and Planners in a style known as brutalism, a simple, block-like form of construction. The renovations will repair mechanical and electrical systems, windows and roofing. To ensure the safety of those in the building while the renovations are taking place, construction crews will install temporary walls to separate building occupants from construction sites. Additionally, construction will be limited to early morning and evening to ensure minimal noise disruptions during the day. Eleanore Colton, a sophomore majoring in environmental studies, said she is not excited about the early morning renovations, but believes the necessity of the work being done far outweighs the negatives. This project will complete the last phase of renovations to the Engineering Building and while staff and students will have to navigate the disruption, Weeks said it will be worth it when the renovations are completed.